Build a roadmap for elder law without causing major disruption. Elder law is a practice area that offers great potential and reward. It is a natural progression for your clients and your firm. During this informative workshop, we’ll define elder law in a way that makes sense and identify a roadmap for learning this area without causing major disruption in your existing practice. 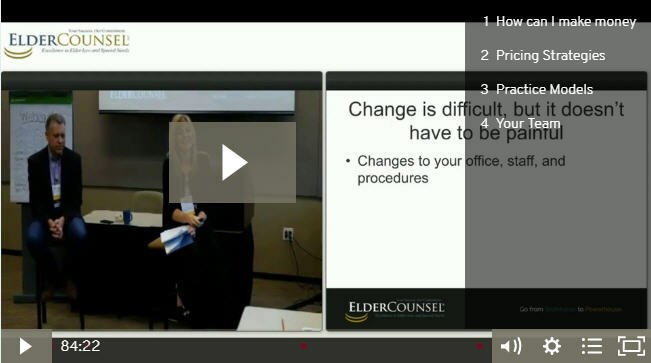 Attend in the classroom or via live stream and gain insights and confidence from attorneys who have added elder law to their existing services, or transitioned to an elder law practice. It may seem like a lot to take on, but the possibilities are great, and this course will get you well on your way!